ILLIONAIRE RECORDS will be holding their 1st anniversary concert on January 29, 2012. 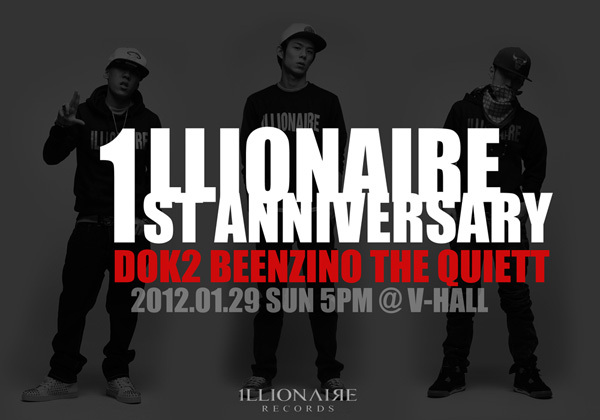 On January 1, 2011, ILLIONAIRE RECORDS was created by hip-hop artists The Quiett and Dok2 and was later joined by artist Beenzino. The trio of the company have been working diligently for the past year releasing four albums and many singles, as well as holding eight full concerts. The first anniversary concert will be held on January 29, 2012 5PM at Hongdae V-Hall, and tickets will be available via Interpark on December 28, 2011.